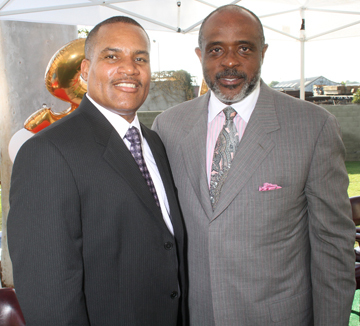 Senator Roderick D. Wright (D-Inglewood) joined members of the Compton community and Compton Unified School District board of trustees in welcoming the district’s new superintendent, Darin Brawley, at a reception in his honor this past Sunday. Compton leaders, residents, students and staff came together for a welcome reception in the CUSD Education Service Center’s courtyard to welcome Brawley, who comes to CUSD after a highly-successful three-year tenure with the Adelanto Elementary School District in San Bernardino County, and hear his vision for the future of CUSD. Wright, who was recently called upon by the Inglewood Unified School District to enact legislation to secure that district an emergency loan, spoke about the importance of making the CUSD and the public school system work to maintain local control. He also addressed the additional challenges posed to public schools today because of a reduction in per-pupil funding and the loss of students to private or charter schools. Several hundred attendees at Sunday’s reception enjoyed a performance by the Centennial High School Marching Band, presentation of colors by the Bunche Middle School Color Guard and Pledge of Allegiance by Foster Elementary Students. Minister J. Kevin Murray gave the invocation, while musical selections were performed by Josue Rodriguez of Compton High School, Whaley Middle School teacher Bevery Brulee and Mayo Elementary School interim principal Fleming Robinson.